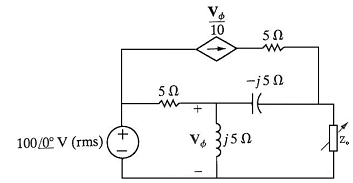 The variable resistor Zo in the circuit shown in Fig. 1 is adjusted until maximum average power is delivered to Zo. d) Calculate the active and reactive power associated with all elements in the circuit including the dependent current source. What are the causes of sparking in the commutator? Explain the methods to reduce the sparking in the commutator? Q. Consider the synchronous counter shown in Figure of the text. (a) Draw its timing diagram. (b) Show the implementation of the same synchronous counter using D flip-flops.